I’ve just finished up House of Hades with my nine year old son, and like the other books that writer Rick Riordan has put out in his Heroes of Olympus series, the sense of action, intrigue and adventure fuels the tales of Percy Jackson and his demigod friends as they seek yet again to save the world. This time, the mission is to close the Doors of Death in Tartarus before the Earth goddess Gaia arises and destroys the Roman and Greek gods and goddesses, and anyone associated with either. There’s a predictability to the books that I have come to expect: the demigod youths split up, set off on different missions, come close to death, find impossible tasks, figure out a way to persevere, and then accomplish what they need to accomplish, come back together as a team, and plan for the next mission which will require them to split up (in the next book). There’s enough action and adventure in House of Hades, though, that I don’t mind, and my son doesn’t care — maybe he likes that predictability — because he is so attuned to the action going on in the story. Leo — The Greek son of Hephaestus, he is the consummate tinkerer and I have come to appreciate his skills more and more as I have become more involved in the Maker Movement. Leo is always remixing his world, taking parts from here and there, and pulling them together to make something new. There’s a great scene in House of Hades where Leo is falling from the sky, but has enough wits about him to create a modified flying machine to save himself. Talk about a Make! Hazel — A Roman daughter of Pluto, she is emerging as one of the more powerful demigods in the group, particularly as she pulls in more magical abilities and finds confidence in her abilities. Hazel ability to control the Mist was a key component here, but I suspect it may be more important as the series moves on. Frank — A Roman son of Mars with family roots also in Chinese mythology, Frank also emerges as a different character in this book after he is tested and survives. His lifeline is a small piece of wood, literally, and if it burns to ash, Frank’s life is over. But he is now learning how to find confidence in strength and power, and to tap his arguing fathers (Greek and Roman personalities at war in his head) to emerge as the protector soldier he is destined to be. Nico — Now here is another character who has been around since the first series and has always been somewhat of a mystery. Nico is a child of Hades (and distant brother to Hazel). He’s not really part of the demigod team here, and yet, his skills at navigating the Underworld prove important on many levels. Interestingly, we learn more about his stand-off nature and how his unrequited and hidden love for Percy Jackson has eaten away at Nico for years. (Percy has no idea). My son and I had an interesting discussion about boys liking boys in one of the more dramatic scenes where Jason befriends Nico, who finally admits to his sexual orientation. It’s daring for Riordan to put that in the story, I think, although it is a small section that only gets briefly references to later on. Overall, House of Hades finds a solid place in the Heroes of Olympus series, and as my son turned to the back pages of the book, he found what he was looking for. The next book — The Blood of Olympus – comes out in the fall of 2014. We’ll be waiting. One of the first Kickstarter campaigns that I invested in was a stopmotion movie by a married filmmaking team whose blog posts I followed out of sheer curiosity. They were making a longer stopmotion movie called Dogonauts, and when they turned to Kickstarted for financing, I figured that I had to put some money where my RSS had been. I invested in them. 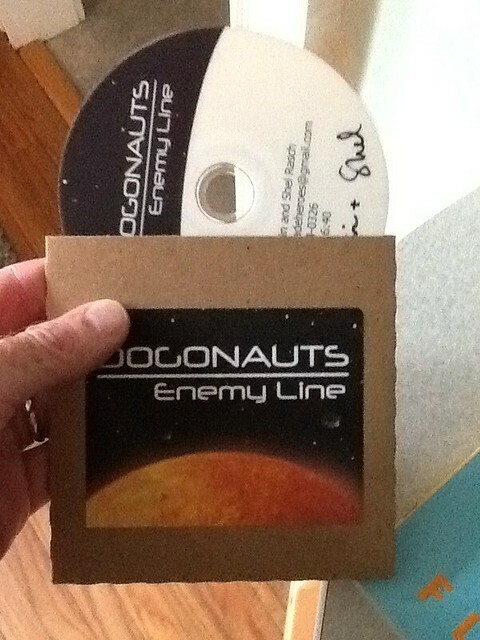 The other day, the DVD of the short film arrived, and Dogonauts: Enemy Line is a lot of fun to watch, and I see I can probably use it as a mentor text for future claymation projects with students (and my sons!). It’s a no-dialogue adventure that pits two aliens against each other as they try to survive a crash on a distant planet. There is plenty of humor as both characters try to rebuilt their spaceships, and both come to an understanding of each other by the end. Yesterday’s Daily Create for DS106 asked us to use mixed media, with the topic of eyes and stars (actually, the prompt read: Ode to your eyes: the stars of today.). I took both eyes and stars sort of literally but struggled for some time with the mixed media element of the prompt. 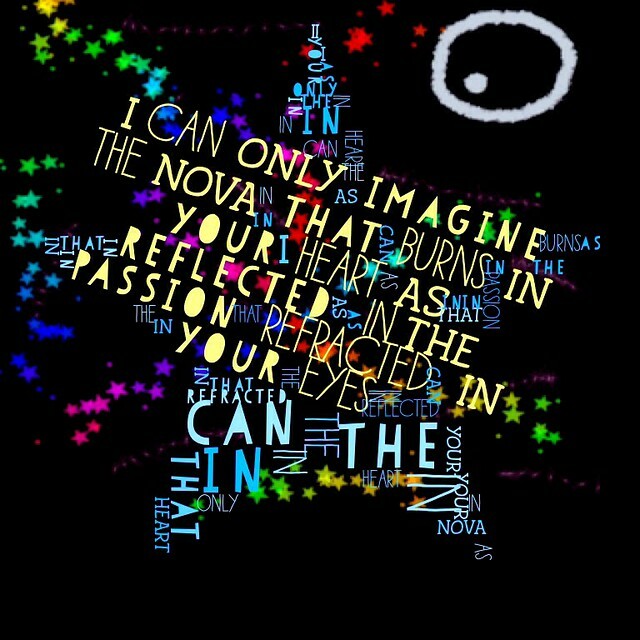 In the end, I used a drawing program on the iPad to make the night sky background with the huge eye, adding some star stickers, and then moved that entire image into an app that allows you to do the writing piece (which I formed in the star shape). The short prose poem came to me as I was doing the drawing. I then tinkered with the entire image a bit with Flickr’s filters and settings. At the start of a professional development session the other night, I asked the participants to take a short survey (which served two goals — gather information to guide the session and show them how to use a Google Form to gather information to guide teaching) about the perceptions we have about our students and their use of technology. They were limited to two choices from each list that I gave them on the things they see as positive and the concerns they have as teachers (so, be aware of the limitations). But here are what they see as positives. Notice how finding information at your fingertips is a huge positive, and second is the use of social networking for a good cause. On the flip side, they also gave information about the negative perceptions, or most pressing concerns, of technology in the lives of their students. Here, the data showed a wider range of views. Concerns about protecting kids from bullying in online spaces and the posting of images online without regard to permanence and/or privacy garnered the most clicks here. We talked about these two topics a lot, particularly with the rise of Instagram in the past year. I’d like to point out that gaming got a bad rap (maybe deserved on some level), and I suspect that many teachers and adults see very little value in gaming, even though that is a huge part of kids’ lives right now. (But, notice in the top chart, a few did select the math/science connections to gaming, so maybe I am reading too much into this). I did not really address that in this workshop, as much of our time was spent doing work around digital identity, ways to address negative online behavior before it happens, and perusal of the CommonSense Media Curriculum. This morning, I looked at yesterday’s Daily Create, which said to take a picture of something small but make it seem larger than it is. Well, we have a ton of Legos around our house and they are perfectly suited for this kind of activity. 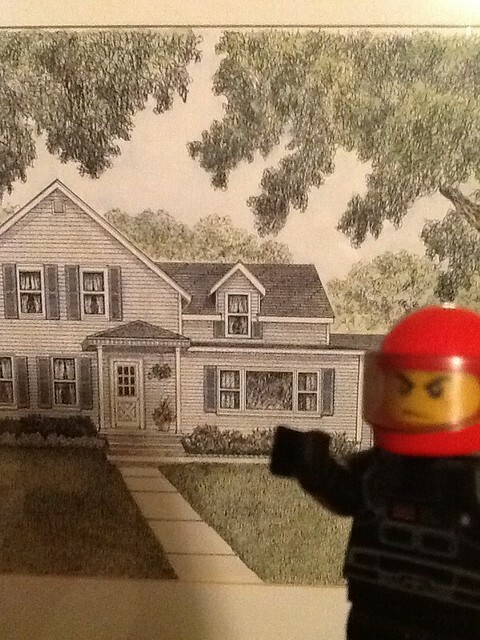 Here, the Lego dude is in front of a hand drawn illustration of our house, seeming like a protector. Be gone, bad vibes! Earlier in the week, the Daily Create had an interesting assignment, which was to use your Barry White voice to create a a video about DS106. I mean, Barry White? The deepest, soulful voice in the world? How cool is that? I used an app to do mine. Sorry, Mr. White. I did not do you justice. And finally, the other day, there was a bird theme going on. 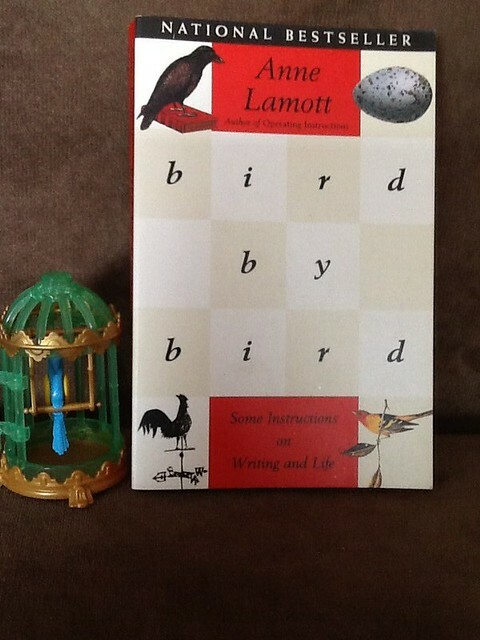 I could not resist pulling out my Anne Lamott book, Bird by Bird, and then put a bird next to it. My colleague and I are facilitating our digital storytelling workshop today, and as part of the continued effort to ease tentative folks into the technology, I created this “recipe” for how to proceed, sprinkled again with some humor. Maybe if enough school administrators read the post, they will better understand the power of writing in a natural setting, and not for test taking purposes. Hopeful? You bet. 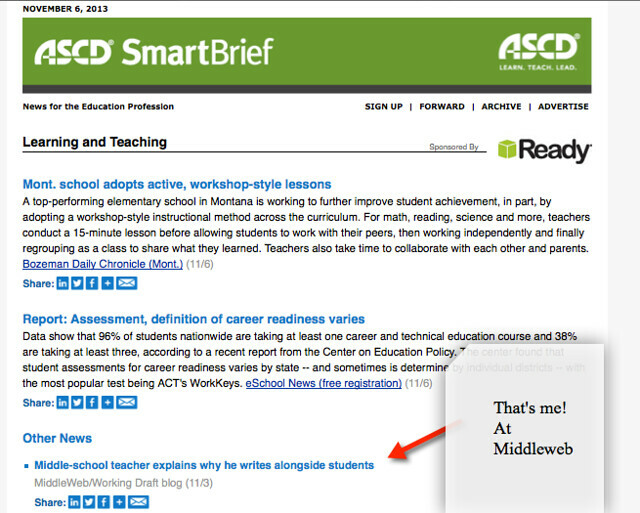 You can read my piece here at Working Draft at Middleweb, and feel free to add comments to the blog post. Maybe your administrator will read it. Over at the Make/Hack/Play, we are encouraged to Make in physical space. 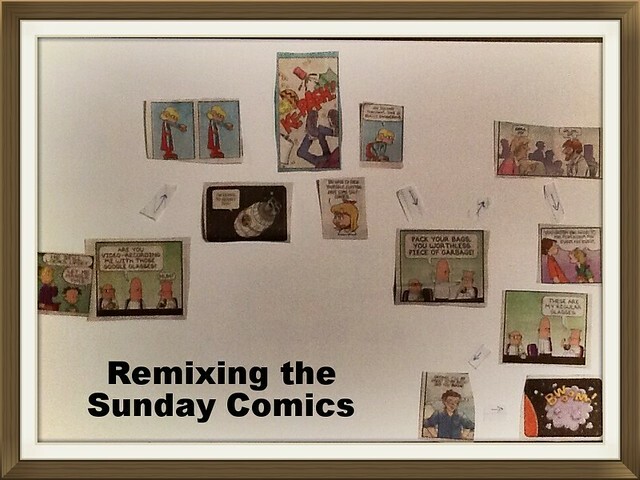 I returned to an idea from the summer and worked to remix the Sunday Comics. This is trickier than at first blush because creating a connected narrative from very different comics, writers, characters and story lines is hard. Here, you have to read each comic with two frames of mind: the comic itself and the story within that small framed narrative AND the larger lens of how might part of this storyline or picture take part in a larger story to be remixed. And you don’t often know what that story will be until you have read all the comics in the section (unless you get lucky and find something neat right away in the first few comics you read). Once you have the larger narrative, you have to figure out which pieces will fit to tell the story, which — to be honest — will always be a bit jagged, due to the mix of art and narratives. But that’s remixing for ya. For this Sunday Comic Remix, I centered on a frame from Dilbert about an accusation of using Google Glass in a meeting without permission, which led to an almost dream-like sequence of embarrassment moments, and then there is an apology, followed by a meta-comic from from Doonsbury with a final combustible ending. I wish the quality of the photo were better (sorry!) but I took it on the iPad. The frame and writing was added in Flickr with the Aviary suite of tools. I have to admit: I was somewhat familiar with the making of the first Atomic Bomb but I did not know how much spying, sleuthing and Cold War calculations went into the push during World War II to build the bomb that forever changed the world after the United States dropped the results of scientific discovery on Japan. Bomb: The Race to Build — and Steal — the World’s Most Dangerous Weapon by Steve Sheinkin came to me for free from the Scholastic Book Club (thank you!) just as a colleague was asking me if I had ever read the book. That is enough of a kismet moment for me to read something. This oversized book for upper middle and high school students has a fast-paced narrative that begins with the discovery of a Soviet spy in our midst and ends with both regret and relief that the Atomic Bomb did what it was meant to do — end World War II. It also began the arms race that has forever put the entire world on edge, even as the Cold War thawed. Look to Iran and North Korea, and Pakistan, and beyond for evidence of how the work at Alamos made us all see the world in a different light. In Bomb, Sheinkin does not shy away from this lens, although much of the non-fiction narrative is geared towards the race that the American scientists were in against their counterparts in the Soviet Union (ostensible, allies, but not to be trusted) and the Nazi Regime in Germany, where all indications were that Hitler was determined to build and use the first Atomic Bomb. Military efforts to slow down the Germans, kidnap their scientists, and beat them to the bomb, while stalling the Soviets and their own spy networks here in the United States, became a dangerous game of cat and mouse. Even knowing how the story ends — with hundreds of thousands of Japanese civilians killed in an instant and a legacy of fallout and radiation for generations to come — Bomb keeps up the pace, which should help keep readers involved in the story that has significant historical value, of only to question science in the corner of the military apparatuses of governments. Yesterday, I shared out a video that I created for the Make/Hack/Play mini-course I am involved in at P2PU with facilitator Karen Fasimpaur. Today, I wanted to explain just how I did it — so consider this is a sort of process piece connected to the Make itself in which I sought to Make a Song, and Make the songwriting visible. Here, I try to make the process visible. I also created this diagram flowchart of my process. 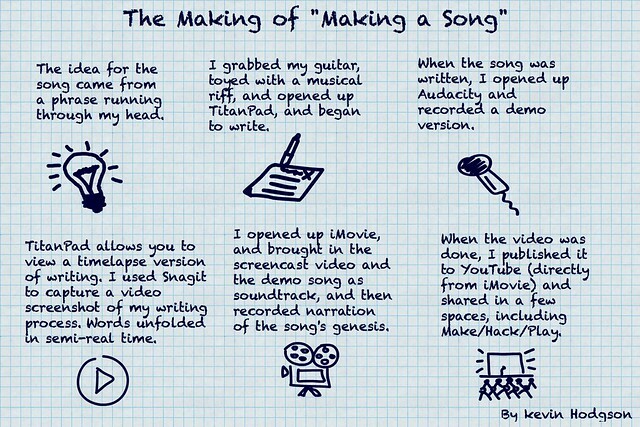 For the first week, Karen suggested we make something in physical space, but I had my head wrapped around music this past weekend, and I decided that I would write a new song, but with the idea of the Maker Space in mind. What I did was sat next to the computer with my guitar and instead of my usual method of scribbling out notes and crossing out words on paper, I used the collaborative freeware tool TitanPad to write. TitanPad works sort of like Google Docs as a collaborative space, but the element that I really love is that it creates a revision timeline video format (of sorts), so you can watch a piece of writing unfold over time. After finishing the song, which is called Set My Anchor on You, I played back my words, watching from the distance as my words were written, removed, revised and restructured. It’s pretty fascinating, particularly for someone like me who types very fast but also makes a lot of mistakes. You can see a lot of backspacing going on. 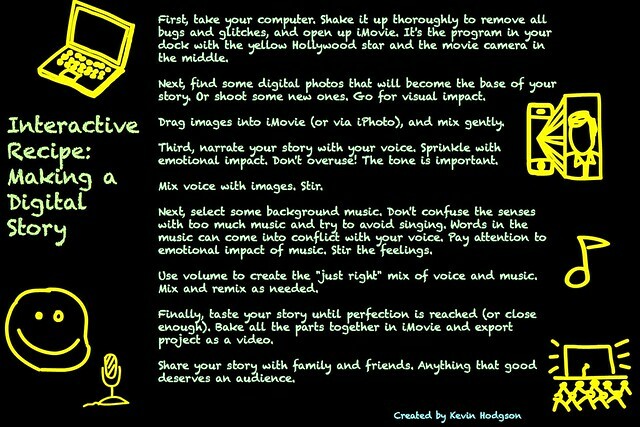 Since my idea of this Make was to capture the songwriting in process, I took a video screenshot (using my Snagit program) of the words flowing on the screen, and then moved that raw video into iMovie, so I could layer in my narration. I also recorded a version of the song in Audacity, created an MP3 file and used that as the background track – so you watch my words, hear my thinking and listen to the song. I then edited the video in iMovie and shared out at YouTube, and linked into our Make/Hack/Play space and beyond, thus going from brainstorm to writing to recording to publishing in a short amount of time.